The design, approved by commissioners Monday, includes a mix of lawns, paths and public gathering areas in land between Peck, Dyer and Ship streets that was once covered by the old highway overpass. 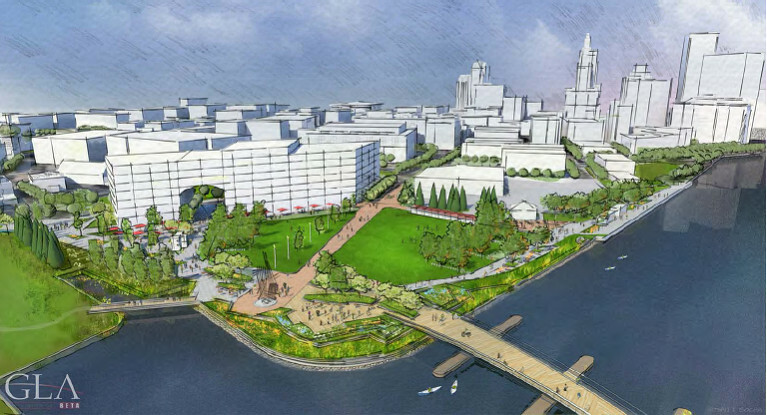 The park plan was remade by the city and its consultants this year on the request of the I-195 Commission after members learned they could develop an additional parcel originally set aside for the parks. The new buildable lot is between the park, Dorrance Street, Dyer Street and Ship Street. Are those new waterways part of the proposal?? That little inlet to the left currently exists. There is a storm drain at the head of it. That actually looks quite nice. I hope we can get some movement on the park and street grid soon, both of which should jump start other development. Is the pedestrian bridge plan still up to date? It is being value engineered. It will probably be substantially different than the winning design. Value engineered?!?! Jef, could you provide more details, please? By whom, at whose behest, to what specifications? Jeff – If I am placing this correctly would that mean that the inconvenient Dyer Street Loop would be gone (yay) and replaced with a more traditional traffic pattern for dyer and eddy and Memorial Blvd? Yes, the loop goes away and Eddy and Dyer connect to each other as a proper two way street just to the east of the current straight alignment. So the loop area becomes parkland. The only reason for the loop was to catch traffic coming on/off 195. You can see this .pdf which is a bit out of date, but gives a general idea of how the rebuilt streetgrid will look. This new park plan has a strip of developable parcels between the new Eddy/Dyer Street and the park, giving the park buildings which line it, rather than being lined on all sides by streets or water. These buildings can then have uses such as cafes/restaurants (bars!) which spill out onto the park. The City Planning Department is working on the bridge design. It is not part of the 195 Commission’s jurisdiction. The City has limited money from the state through RIDOT to spend on the bridge. I would not have my heart set on the cafe from the winning design’s proposal. Thanks Jeff – I am assuming the 2 ends of Eddy street where the highway was might be reconnected as well or might that inhibit future development? I’m not sure what the final determination was on that part of Eddy Street. There was discussion about not rebuilding it so as to reserve the space for a project that might need a large parcel, such as a lab. Thanks very much, Jef. Is there any hope for a reasoned, transparent process such as the Planning Department (A) publicly presenting the original, winning design for anyone who might have missed it, (B) publicly presenting the scaled-down version that they believe is possible with current funds, and then (C) opening up the possibility of some sort of public-private partnership to bridge (no pun intended) the financial gap between A and B? I realize this is a huge undertaking, but might we convince them that it’s better than the backlash that would likely result from doing nothing but crying poverty and presenting a severely lower-value version of a very popular original?